The CAT3606 controls up to four LEDs for the main Display and two LEDs for the sub-display in cellular phones. The device is capable of operating in either 1x (LDO) mode or 1.5x Charge Pump mode. 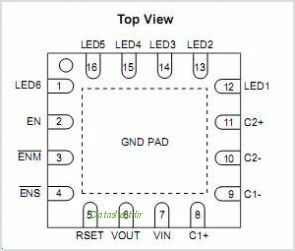 All LED pin currents are regulated and tightly matched to achieve uniformity of brightness across the LCD backlight. An external resistor (RSET) sets the nominal output current. This is one package pinout of CAT3606,If you need more pinouts please download CAT3606's pdf datasheet. This is one application circuit of CAT3606,If you need more circuits,please download CAT3606's pdf datasheet.